With the rising cost of hay, estimating the amount of hay required to keep happy and healthy cows without incurring a financial loss is more important than ever before. Estimate the number of bales you need by assessing individual needs per cow and factoring in the weight and quality of the hay you intend to feed. Depending on hay quality, daily intake will range from 1.8 percent to 2.7 percent of a cow’s body weight. For fresh hay cut from quality grass in its prime, assume an average of about 2.5 percent. Increase this percentage for older or poorer-quality forage. Multiply this number by the average weight of cows in your herd to assess each cow’s daily need. For cattle averaging about 1,300 pounds, 2.5 percent of their body weight, or 1,300 times 0.025, results in a daily need of 32.5 pounds per head. Depending on how you store your hay and what type of feeder you use, a certain amount of each bale will be wasted either through spoilage or scattering. 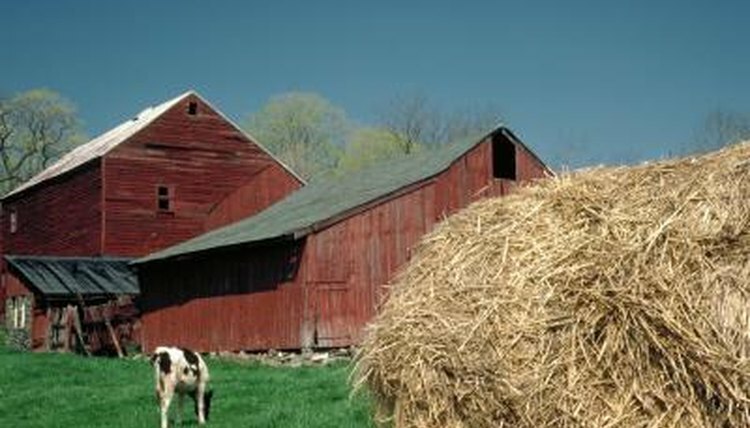 For hay stored outdoors, assume about 20 percent of each bale will be lost, while hay stored indoors may result in less waste. Adjust each cow’s daily need by this percentage. For a cow with a daily need of 32.5 pounds and hay kept outdoors, multiply 32.5 by 120 percent, or 1.2, for a result of 39 pounds. The number of days per year that your cattle will be fed hay depends on your climate and the quality of graze available. If you have ample space, quality grass and a long growing season, your cattle may need hay only during winter months, while livestock on dry lots or in colder climates may need hay year-round. If your cattle will have sufficient grass from May through September but need hay the remainder of the year, this leaves about a 210-day feeding period. Multiply this number by the adjusted daily needs per cow -- according to example, 210 times 39 for a yearly need of 8,190 pounds. Assuming you have chosen a supplier for your hay, determine an average weight per bale based on a sampling of the bales. The weight of round bales will vary based on size and grass type, so having individual bales or trailer-loads weighed is helpful in assessing your inventory needs. Once you’ve determined an average bale weight, you will need to subtract the amount of moisture contained, which can be estimated at about 20 percent for bales stored outdoors. For a bale weighing 1,200 pounds, this leaves about 960 pounds of edible dry matter. Determine the number of bales of hay that each cow needs by dividing the cow’s yearly need by the adjusted weight of each bale. For a cow needing 8,190 pounds of hay per year and a bale weight of 960 pounds, divide 8,190 by 960 for a yearly need of about 8.5 bales per cow. Multiply this by the total number of weaned cattle in your herd. For example, 45 cows multiplied by 8.5 bales per cow results in a total need of 383 bales.